While there are still questions surrounding whether Geneva College or Vanderbilt was the first school to play a college basketball game, one thing is certain — the sport has exploded in popularity since that start in 1893. In the 125 years that have followed, basketball has become one of most-watched and attended college sports. Because the fans are such a big part of this rise, basketball programs around the nation have invested in developing and improving arenas that will do them justice. These are the nine largest college basketball arenas in the country, according to seat capacity listed by each institution. Syracuse University The Carrier Dome is the largest in college basketball. Syracuse's basketball arena is the biggest by a landslide, coming in first place with 34,616 seats. The huge space makes more sense once you know that the Orange football and lacrosse teams also play there — and the capacity is increased to 49,262 for those games. Syracuse fans have a new reason to get excited about the massive arena that originally opened in 1980 — renovations coming in the next few years include a new roof, scoreboard and air conditioning. Kentucky Athletics Rupp Arena currently seats 23,000 fans. Kentucky fans have 23,000 seats to occupy in the arena named after one of the winningest coaches in the game, Adolph Rupp. The lower level includes 10,000 cushioned seats while the upper deck makes up 13,000 seats in metal bleachers. According to UK Athletics, the Wildcats have won almost 90 percent of the games played there since it opened in 1976. When all planned renovations are completed in coming years, the arena is set to seat approximately 20,500 fans. Louisville Athletics Louisville plays at the KFC Yum! Center. Louisville's arena comes in third on the list, just under 1,000 seats behind Kentucky. The KFC Yum! Center seats 22,090 fans during men's basketball games. The arena is also home to Louisville's women's basketball and volleyball teams. Because the name of the arena alone will probably make fans hungry, the 721,762-square foot arena includes an incredible 176 points of sale concessions. North Carolina Athletics Dean Smith Center is home to the Tar Heels. The arena in Chapel Hill has been home of the Tar Heels since 1986. The first game played there saw No. 1 UNC beat rival No. 3 Duke 95-92. Dean Smith Center seats 21,750 fans and has helped the Tar Heels remain in the top five in national attendance all but one season since it was opened. Tennessee Athletics Thompson-Boling Arena has recently been redone. The Tennessee Vols play at Thompson-Boling Arena, named for donor B. Ray Thompson Sr. and UT president Dr. Edward J. Boling. The space has room for 21,678 fans on game day in Knoxville. When the arena first opened in 1987, it brought in more than 20,000 fans at every game that season. The Tennessee women's basketball and volleyball teams also play at Thompson-Boling. Georgetown Athletics Capital One Arena seats 20,600 fans. Located in Washington, D.C., Capital One Arena is home to many teams. Along with the Hoyas, the 20,356-seat arena hosts Capitals, Wizards and Valor games. Georgetown has played in the arena just down the road from Capital Hill since 1997. Many NCAA tournament games have been played here, with its huge video scoreboard and video walls being a main attraction. Molly Sequin | NCAA MSG host NCAAt games in addition to St. John's home games. This one needs no introduction — Madison Square Garden is known around the world, and seeing a basketball game there is definitely one for the bucket list. In addition to hosting the Knicks, Rangers, NCAA tournament games and concerts, MSG is the home court for St. John's. MSG was built over Penn Station in 1968 and seats 19,812 during St. John's home games. North Carolina State Athletics PNC Arena is home of the Wolfpack. The Wolfpack made the move from Reynolds Coliseum to PNC Arena in 1999. 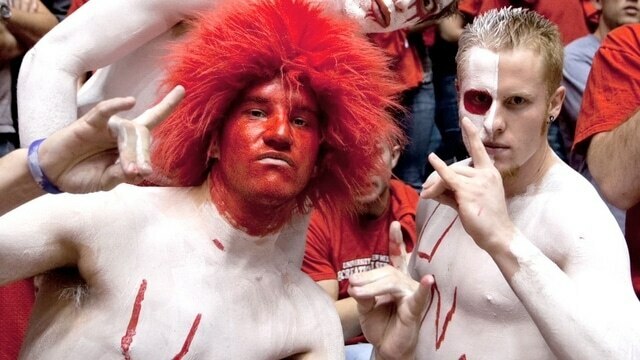 North Carolina State's home can accommodate 19,722 fans on game days. Unlike many other college basketball arenas, Wolfpack fans can dine at a 300-seat restaurant without leaving the action. The NHL's Carolina Hurricanes also play at PNC. Ohio State Athletics The Schottenstein Center holds 19,500 fans. The Schottenstein Center, with a capacity of 19,500, is home to Ohio State's men's and women's basketball teams. It also seats 17,500 fans during men's ice hockey. The Schottenstein Center is the largest basketball arena in the Big Ten. On top of hosting these Ohio State athletic events, the space also attracts huge concerts to Columbus, where the seating is then amped up to accommodate for 20,000 visitors.